Home » Books & Music » Om Namah Shivaya: Mantra for Meditation, EnLightenment, and Ecstatic Dancing! In the yogic tradition, the Mantra Om Namah Shivaya is known for its Power to Invoke immediate EnLightenment. This Supreme Mantra Liberates us from suffering and increases Peace, Spiritual Strength, Divine Protection and Creativity. Repeating this Ancient Sacred Healing Sound increases the Light within, dissolving obstacles and negative layers of programming. 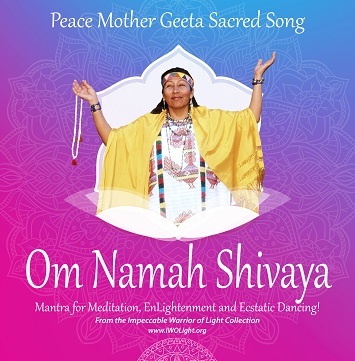 Her Holiness Peace Mother Geeta Sacred Song, Siddhartha Dukate and the Global Peace Musicians have created multiple Grace-bestowing tracks for serene Meditation, rest, creativity…and your Bliss Dance!